I love so many of the behind-the-scenes task that occur when new beans are added to the Rally Beans coffee fundraiser line up. I get to sample new beans, come up with a catchy name, dream up a cool concept for the graphics on the label. Honestly, this process is one of the best parts of owning Rally Beans. But for this one, I didn’t do it alone. 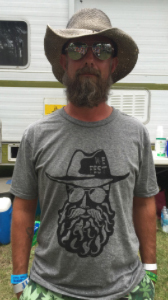 I had help from Dirty Farmer’s inspiration, the original dirty farmer, my good friend, Austin Wittmier. Austin is a very visible part of Bill Erbes Farm, and the ‘face’ of the CSA to many of their members He’s animated, charismatic, funny, a little bit snarky & a little bit edgy – definitely NOT the typical North Dakota farmer of northern European descent, all of whom I will forever remember as very stoic. It would have been considered edgy for my great-grandfather to smile for a family picture. Tattoos and earrings might have gotten him thrown out of the township. Last year, Austin proposed that we add a new coffee inspired by a very specific picture of him. 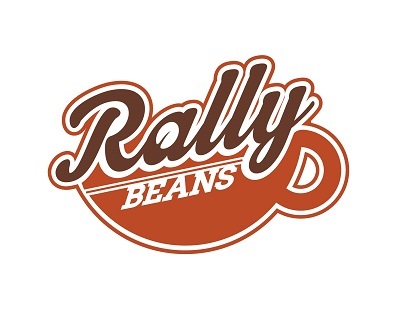 He wanted to be able to use this Rally Beans coffee for CSA-related activities, such as donations and gifts. Austin didn’t have to ask me twice – I couldn’t wait to replicate that image of him on a coffee label! Together, we came up with a graphics concept and sent it off to Hannah for design. Then we got to the best part – sampling some new coffees. Austin wanted ‘his’ coffee to be dark and bold, something that true coffee connoisseurs would love, and he wanted it to be organic. I think we found the perfect bean. Austin’s coffee is a lot like Austin himself – bold, smoky & smooth. And I get a kick out of the fact that the Dirty Farmer roast is part Italian, just like Austin himself. Dirty Farmer is Fair Trade Certified and Certified Organic. It is a post-roast blend of French- and Italian-roasted Peruvian beans, and has a big, full, creamy body with a surprisingly smooth acidity. Dirty Farmer is available in 12 oz bags of ground beans, and available in 2-lb or 5-lb bags of whole beans via special order (email info@rallybeans.com for more information about special orders). 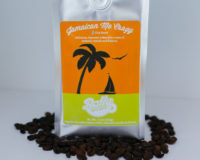 Dirty Farmer will be available in the coffee fundraisers starting this summer.